Free online Vicsek fractal generator. Just press a button and you'll automatically get a Vicsek snowflake. There are no ads, popups or nonsense, just an awesome Vicsek box generator. Press a button, get a Vicsek fractal. Created by mathematicians for mathematicians. Draw Saltire Form Generate the saltire form of Vicsek fractal. Draw Cross Form Generate the cross form of Vicsek fractal. Internal color. Internal fractal fill color. Line Width Vicsek curve width. Padding Padding around Vicsek curve. Vicsek fractal generator tool What is a vicsek fractal generator? This tool draws Vicsek fractals. 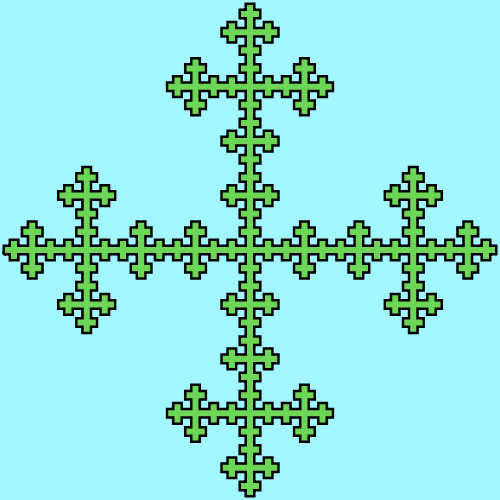 A Vicsek fractal is also known as a Vicsek snowflake or a Vicsek box. It's a self-similar fractal structure and has two types - the saltire form and the cross form. These two forms only differ by the arrangement of squares. In saltire form the four squares on the left, right, top and bottom are removed, and other squares are left untouched. In cross form it's reversed. When generating the box fractal, you can set iteration count and the width and height of the fractal. You can colorize this fractal using three colors - for the background, for the line and for the inner part of the curve. You can also change padding around the curve and the thickness of curve itself. Mathabulous! 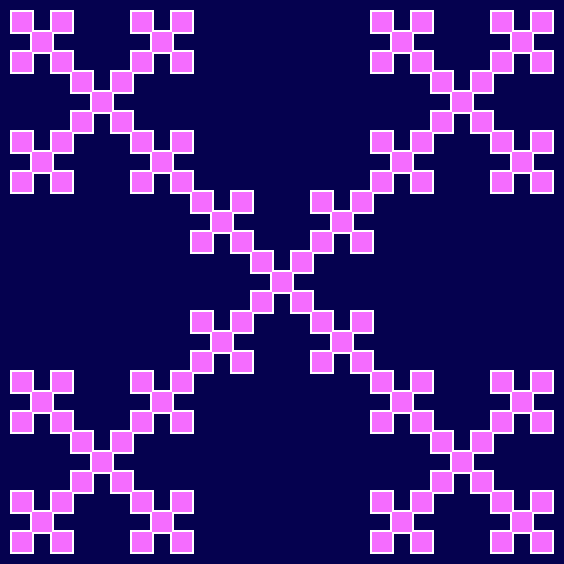 This example draws a 3rd order saltire form Vicsek snowflake on a 564x564px square with a navy background color, white curve color and pink inner color. It sets curve thickness to 4px and padding to 10px. This example generates a Vicsek box with a black outline and green inside on a light blue background. It uses 4 iterations to generate this fractal. 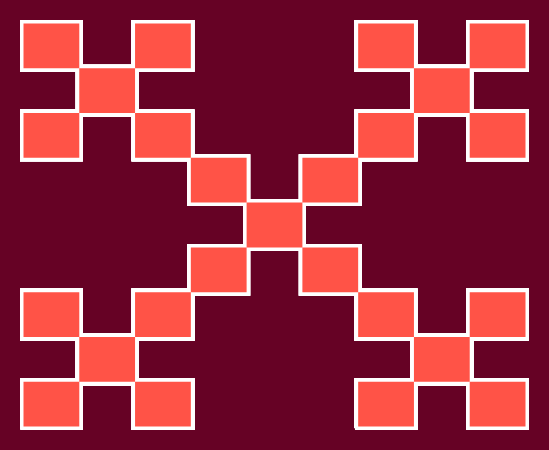 This example draws rectangular Vicsek box with dimensions 600x500px using only 2 iterations. It uses redish color theme.